Dustin Johnson is seeking to become the fifth player to win back-to-back titles at the Pebble Beach tournament. 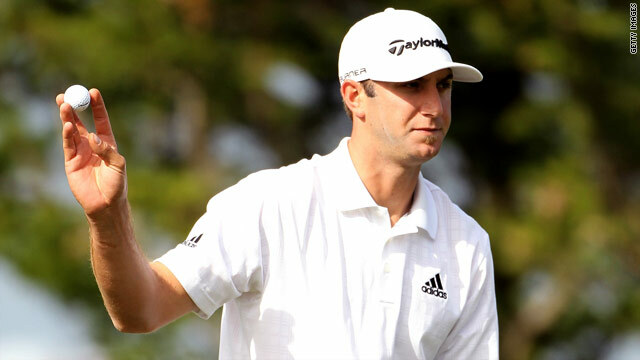 (CNN) -- Defending champion Dustin Johnson faces a final-round showdown with veteran Paul Goydos at the AT&T Pebble Beach National Pro-Am after the duo took a four-shot lead over the field on Saturday. The duo both fired eight-under-par 64 in their third rounds for a 54-hole total of 18-under 196, having been in a six-way share of the lead at the halfway stage of the U.S. PGA Tour event, which is played at three separate courses. Fellow Americans Bryce Molder and J.B. Holmes have some catching up to do after carding 68s which saw them drop back to a tie for second with Australian Matt Jones (66). The big-hitting Johnson, playing on the Spyglass Hill course, matched his first-round score as he started with an eagle three at his first hole and picked up another four shots by the seventh hole. A bogey at 10 slowed his progress, but the 26-year-old bounced back immediately with another eagle at 11 and also birdied 14 and 17 before dropping a shot at his final hole of the day as he over-hit his birdie putt and missed the return. The 46-year-old Goydos, playing at Pebble Beach, had a flawless round which featured an eagle at his second hole and six other birdies, including two at the last three holes. He finished tied for fifth at the Northern Trust Open last weekend, but has not won a title since his second victory at the 2007 Sony Open -- which came 11 years after his maiden win at Bay Hill. Germany's Alex Cjeka was the top non-American in sixth place on 201 after a 69 at Pebble Beach. Meanwhile, an incredible seven players are tied for the lead going into the final round of the European Tour's Avantha Masters in New Delhi, India. England's Richard Bland and Sweden's Fredrik Andersson Hed both climbed to the top of the leaderboard with six-under-par 66s to be in a group on 205. Bland's 49-year-old compatriot Barry Lane, seeking to become the tour's oldest winner, is also in contention despite a 71 which left him tied with Taiwan's Yin-shin Chan (72), home hope Rahil Gangjee (69), Australia's Darren Beck (70) and Tetsuji Hiratsuka of Japan (70). Scotland's David Drysdale (71) was tied for eighth another shot back with Hong Kong's Kwanchai Tannin (70) and Australian Andrew Dodt (71), with former European Ryder Cup star Darren Clarke in a group on 207 after carding.